July 2017 – It’s neither a Laurent Ferrier watch nor an URWERK, yet the signatures of both firms appear on its back. The existence of this unexpected watch defies logic because it is the joint effort of two watchmaking companies that couldn’t be more different. Each bases its identity on the opposite ends of watchmaking’s stylistic spectrum. On one side, the expression of time-honoured traditions; on the other, an anarchic effort to overturn conventions. 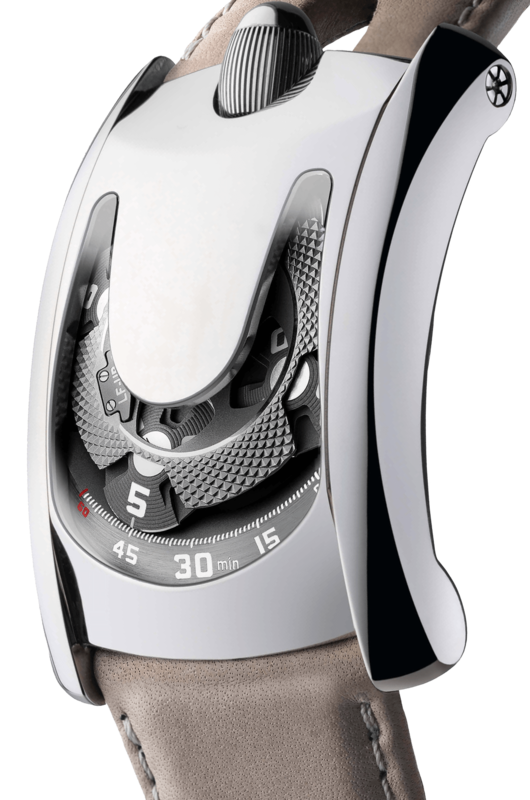 Laurent Ferrier and URWERK have created a piece of work that is unique, for only one-of-a-kind watches qualify to be sold at the Only Watch auction in aid of the battle against Duchenne muscular dystrophy. This remarkable watch also offers a unique opportunity to witness two independent brands working together to produce a watch for the Only Watch 2017 sale. Laurent Ferrier has forged an enviable reputation as master of the definitive watch in the classic style. URWERK, on the other hand, has spent the last 20 years challenging the watchmaking world with its bold originality. The result of this extraordinary association is in front of your eyes. Let’s deal with the case first. You can well imagine the perfect, almost aerodynamic, curves coming to life in the confident strokes of Laurent Ferrier’s pencil. “It’s a cleanly cut watch. My friends know my love of cars, a predilection expressed in this watch. This new creation is like streamlined coachwork, fluid and without any affront to the eye,” he explains. Such a design demanded a special material. 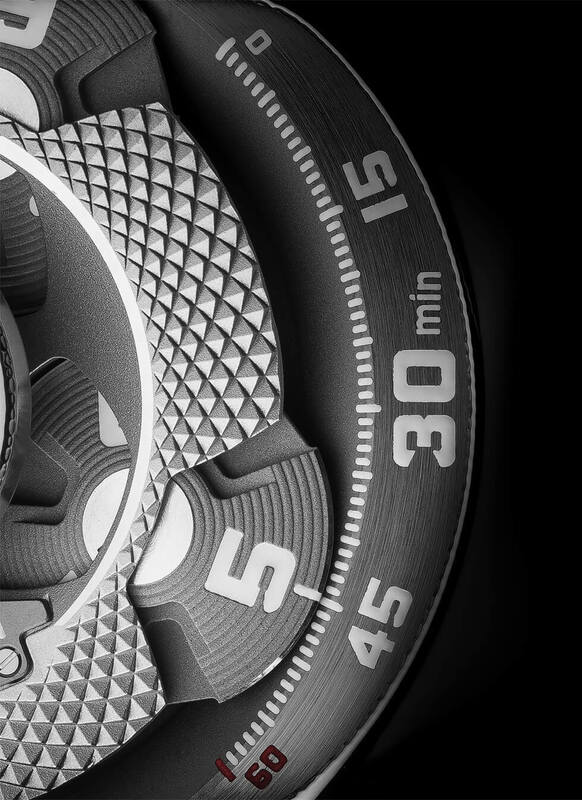 “For that we turned to the Cendres+Métaux company in Biel.” The case was shaped from an exclusive alloy called ARPAL+, specifically developed for this unique watch. ARPAL+ consists of 75% precious metals and resists wear and scratches better than white gold or steel. Its colour never fades, nor does it oxidise. This alloy was first developed for the electronics industry where it is much appreciated for its strength and because it is easily worked. The polished case of the Only Watch by Laurent Ferrier and URWERK is what first catches the eye. It reflects light like no other and seems to sparkle. In contrast, URWERK’s movement was created with every restraint. Unlike the case, it is almost self-effacingly colourless. The four hours satellites are in a matt pearly grey with diamond-polished outlines while the hours and minutes markers are painted in white SuperLuminova. “We undertook this project with the greatest respect for each other’s work” Felix Baumgartner declares. “We held a great number of operational meetings, setting up a dialogue and developing a friendship that is apparent in the final result. We were aiming for subtlety rather than performance” he adds. The time is shown by four satellites, each bearing three hours numerals, which successively sweep past the track of minutes. This original and intuitive way of telling the time is aided by a cover in polyetheretherketone, a thermoplastic known as PEEK, which hides the satellites that are not engaged in indicating the time. The satellites turn on a hidden carrousel, at the heart of the successive passage of the hours. It’s no easy job to engineer the smooth and silent revolutions of a module that weighs 500 times as much as a conventional set of hands. The story started behind the watchmaking scenes. It was in November 2015 at a watchmaking exhibition like many others, thousands of kilometres away from Geneva. There, two watchmakers, exiled from the cocoons of their respective workshops, made a tentative effort to escape the crowds and take a break. Slightly bewildered by friendly bustle, they sought refuge under a staircase. They hardly knew each other, though their paths had crossed, but destiny seemed to have brought them together. Thus did Laurent Ferrier and Felix Baumgartner meet. Laurent Ferrier offers alternatives to all devotees of classic mechanical watchmaking. The workshop develops movements crafted in harmony with the finest traditions, while enriching them with high-performing and genuinely innovative technical attributes. Designed for devotees of pure values, it updates horological fundamentals – a renewal of origins that positions Laurent Ferrier as a well-respected member of the exclusive circle of mechanical Haute Horlogerie. Hailing from a family with a watchmaking tradition stretching back three generations, Laurent Ferrier, the emblematic figure of the brand bearing his name, is profoundly attached to the excellence of watchmaking professions. 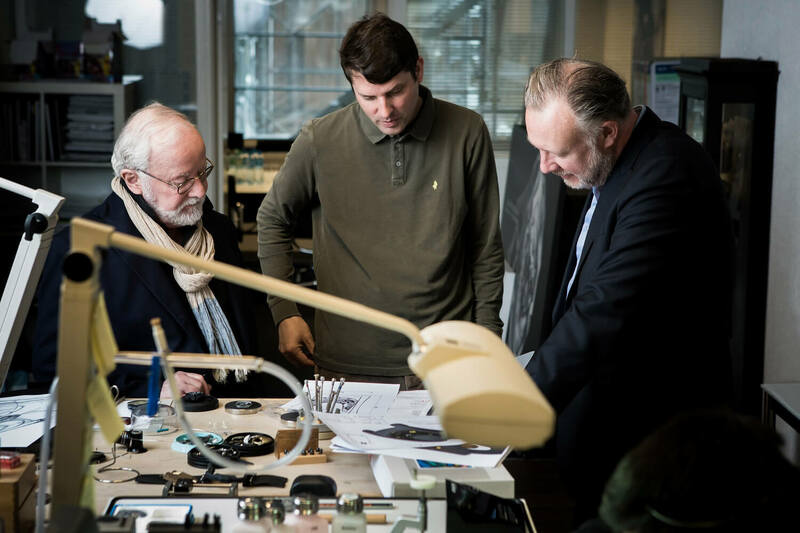 His 37 years to date in the field of design, technical research and watch external parts, both his inventiveness and his quest for perfection pursued through a faultless career. Born in Geneva in 1946, Laurent Ferrier took a complete watchmaker’s training course at the Geneva Watchmaking School. Upon graduation, he began his career in movement development and prototyping, thereby becoming familiar with the construction of Fine Watchmaking calibres. His passion for motor sports led him to a change of professional scene for several years. During this period, he devoted his skill to making automobile components, while in 1979, his talent as a driver earned him a third place in the overall rankings of the legendary Le Mans 24 Hours endurance race, at the wheel of a Porsche 935T. Laurent Ferrier bridges the gap between horological tradition, embodied by a wealth of details and finishes, and industrial innovations. Its movements feature an entirely novel construction and are made from cutting-edge materials, the goal being to achieve a perfect blend of classic aesthetics and ultra-reliable functionality. Although URWERK is a young company established in 1997, it is recognised as one of the forerunners of the new wave of watchmaking. Producing just 150 watches a year, the company sees itself as a craftsman’s studio where traditional expertise coexists with avant-garde styling. The company manufactures modern and complex watches that are unprecedented and in keeping with the most demanding criteria of fine watchmaking: independent design and research, advanced materials and handcrafted finishes. The name URWWERK comes from the ancient city of Ur of the Chaldees in Mesopotamia, founded nearly 6,000 years ago where the Sumerian inhabitants first established units of time based on the shadows cast by its monuments. Ur in the German language also means primeval or original and Werk means an achievement or a mechanism. Thus URWERK can be translated as an original movement — a tribute to generations of watchmakers whose work has resulted in what we know today as haute horlogerie, or superlative watchmaking.